The concept is based on progressively and slowly increasing the load on the plantar fascia so that it can adapt to increasing loads and better tolerate the loads that are placed on it. There is NO evidence to support this, but it does meet the criteria of biological plausibility, theoretical coherence and consistent with the available evidence; ie its makes intuitive sense to do this. The evidence that it is consistent with is the research that has been done on tendinopathy and the progressive resistance and overload to adapt tendons to load as part of the rehabilitation. The aim of this study was to investigate the effectiveness of shoe inserts and plantar fascia-specific stretching vs shoe inserts and high-load strength training in patients with plantar fasciitis. Forty-eight patients with ultrasonography-verified plantar fasciitis were randomized to shoe inserts and daily plantar-specific stretching (the stretch group) or shoe inserts and high-load progressive strength training (the strength group) performed every second day. High-load strength training consisted of unilateral heel raises with a towel inserted under the toes. Primary outcome was the foot function index (FFI) at 3 months. Additional follow-ups were performed at 1, 6, and 12 months. At the primary endpoint, at 3 months, the strength group had a FFI that was 29 points lower [95% confidence interval (CI): 6–52, P = 0.016] compared with the stretch group. At 1, 6, and 12 months, there were no differences between groups (P > 0.34). At 12 months, the FFI was 22 points (95% CI: 9–36) in the strength group and 16 points (95% CI: 0–32) in the stretch group. There were no differences in any of the secondary outcomes. 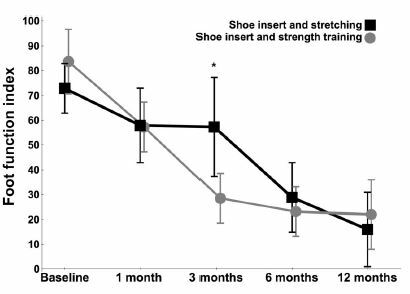 A simple progressive exercise protocol, performed every second day, resulted in superior self-reported outcome after 3 months compared with plantar-specific stretching. High-load strength training may aid in a quicker reduction in pain and improvements in function. Basically they took a group of people with plantar fasciitis and randomized them to a stretching program or a program of ‘strengthening’ that consisted of calf muscle raises with the toes dorsiflexed to tension the plantar fascia via the windlass mechanism. Both groups were also given a Tuli’s polar bear gel heel cups. The author of the above paper described in more detail the interventions on Tom Goom’s blog. There were no differences found between the two groups in the primary and secondary outcome measures at 1, 3, 6 and 12 months except for an improvement in the primary outcome measure (the Foot Function Index) for the strengthening group at 3 months. firstly, there was no control or placebo group in the study. The “control” in the name, randomized controlled trial is there for a reason. All the study really did was compare two treatments (nothing necessarily wrong with comparative studies). You only have to look at the other randomized controlled trials on plantar fasciitis to see the improvement that occurs in the placebo, sham, control or non-intervention groups. We have no way of knowing if the improvement in the study was going to happen anyway. The natural history of plantar fasciitis is to get better, so we do really need to know if the interventions used were better than the natural history. there were what appears to be a number of differences in the baseline characteristics between the two groups and the authors presented no statistical analysis of these differences for readers to evaluate the success of the randomization. From a visual inspection of the data, I suspect that some of them probably were statistically significantly different. In the analysis, the authors did state that they adjusted for the baseline differences, but were very scant on details of exactly what they did so it could be judged if appropriate or not. they appear to have way overstated the results of the study. For the primary outcome measure, there was no differences at 1, 6 and 12 months between the two groups; there was only a difference at 3 months. For all the secondary outcomes they measured, there were no differences at 1, 3, 6 and 12 months in any of them, except for a difference in pain levels at 3 months. That is certainly not the compelling evidence that this study is being widely interpreted in social media as having. they did state that they a priori choose 3 months as the primary endpoint, which coincidentally is the only point in 12 months which there were differences between the groups. I did a search of several clinical trial registries to see if they registered the trial with this a priori choice of 3 months, but I could not find any registration of the study. there were drop outs in both groups and they did use the intention to treat analysis (great! ), but no information is provided on the reasons or characteristics of those that dropped out. There is nothing wrong with drop outs in studies. They happen. Its just the characteristics of that group need to be described for a proper appraisal. You can see the downward trend in the primary outcome measure over time and the difference at only 3 months; also note the apparent baseline differences. The problem is I would expect to see the same downward trend in a non-intervention group or a group just wearing the Tuli’s polar bear gel heel cups, so we have no way of knowing if the ‘slope’ of the downward trend was greater with the two interventions or not. I not sure I agree, but I even picked up a comment in social media on the study that the slope may have been greater with a non-treatment group and the two interventions delayed improvement! I can see how that statement could be made and there is a rationale: ie both exercises aggravated the symptoms but the improvement still happened due to the natural history or the Tuli’s polar bear gel heel cups. Without a non-intevention group or a group just wearing the Tuli’s polar bear gel heel cups we will not know from this study. Do they state in their study how they measured exercise compliance? Secondly, do you think the addition of gel heel cups to both groups in their study is an unnecessary confounding variable? Technically its not a “confounder” as both groups had them. The idea of such trials is that all groups get treated exactly the same except for the intervention under investigation. However, it could be that the gel heel cups were why both groups got better and the strengthening group did better at 3 months because the stretching irritated the plantar fascia more, not because the strengthening was better – they really did need a third group with just the heel cups. As a side note the use of the towel under the toes. I know you have suggested the effects on windlast, but what about consideration for the length tension relationship and the associate effect on FDL and FDB. In physical therapy world’s, there’s a theory of synergistic overload in which weak, or mechanically disadvantaged agonists are unable to maintained load over a period of time. Consequential overuse of synergists prevail, feeding into further under use of the agonist. Theoretically this may even feed into dysfunctional motor programing issues. By puting the digits under passive extension with the towel you are altering the length tension relationship of the synergist making it easier to isolate weakend (not always the case) or functionally impeded agonist. Ensuring the patient is cued not to “claw” into the towel and the rearfoot remains inverted, you may be increasing the likliehood of tib post driving the movement. Perhaps it’s stengthening of structures that are anatomically designed to control/bare rotation force during stance that reduces load to the plantar fascia allowing healing to occur. Rather than increasing the load tolerance of the fascia itself. Thats my point! I would expect to see an improvement in plantar fasciitis with just the use of the silicone heel cups they used (Pieffer et al showed that). It could well be that all the improvement was due to them and both the stretching and strengthening groups irritated the plantar fasciitis; its just the stretching irritated it less and hence the statistical difference at 3 months – I not saying that is what happened, but it can not be ruled out. Sadly, I do want to believe this approach is helpful, but how much weight do you give that belief based on the data.